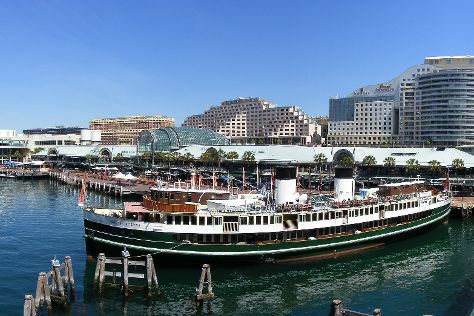 On the 2nd (Sat), wander the streets of Darling Harbour, then don't miss a visit to Sydney Opera House, and then wander the streets of The Rocks. On the 3rd (Sun), you'll have a packed day of sightseeing: kick back and relax at Manly Beach, admire the natural beauty at Royal Botanic Garden Sydney, and then tour the pleasant surroundings at Bondi Beach. To see traveler tips, where to stay, ratings, and tourist information, read Sydney travel site . Lewiston, USA to Sydney is an approximately 27-hour flight. The time zone changes from Pacific Standard Time to Australian Eastern Standard Time (New South Wales), which is usually a 18 hour difference. In March, Sydney is warmer than Lewiston - with highs of 79°F and lows of 66°F. Finish your sightseeing early on the 3rd (Sun) to allow enough time to travel to Hobart. Start off your visit on the 4th (Mon): look for all kinds of wild species at Bonorong Wildlife Sanctuary, admire the natural beauty at Royal Tasmanian Botanical Gardens, then enjoy the sand and surf at Bellerive Beach, then kick back and relax at Opossum Bay Beach, and finally tour the pleasant surroundings at Kingston Beach. Here are some ideas for day two: indulge in some culinary diversions at a local gastronomic tour. For traveler tips, where to stay, maps, and tourist information, read Hobart sightseeing planner. Traveling by flight from Sydney to Hobart takes 4.5 hours. Alternatively, you can do a combination of train, ferry, and bus; or do a combination of bus and ferry. Traveling from Sydney in March, things will get a bit cooler in Hobart: highs are around 71°F and lows about 52°F. Finish your sightseeing early on the 5th (Tue) so you can drive to Coles Bay. 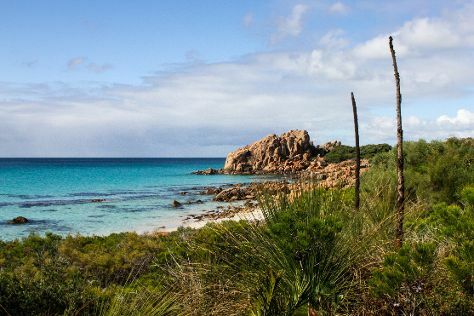 Start off your visit on the 6th (Wed): explore and take pictures at Coles Bay Jetty, see majestic marine mammals with a dolphin and whale watching tour, and then admire all the interesting features of Wineglass Bay Lookout. On your second day here, surround yourself with nature on a nature and wildlife tour, then learn about winemaking at Spring Vale Wines, and then enjoy the sand and surf at Spiky Beach Conservation Area. To see more things to do, other places to visit, ratings, and tourist information, refer to the Coles Bay trip maker tool . Getting from Hobart to Coles Bay by car takes about 2.5 hours. Other options: do a combination of bus and taxi. Finish your sightseeing early on the 7th (Thu) so you can travel to Albany. Discover out-of-the-way places like Nanarup Beach and Little Beach. Visit Lights Beach and Misery Beach for some beach relaxation. Explore the numerous day-trip ideas around Albany: The Denmark Heritage Cider Company (in Scotsdale) and Greens Pool (in Denmark). The adventure continues: stroll through Goode Beach, pause for some photo ops at Desert Mounted Corps Memorial, explore the striking landscape at The Gap and Natural Bridge, and see the interesting displays at National Anzac Centre. To find traveler tips, ratings, reviews, and tourist information, read Albany route maker . Getting from Coles Bay to Albany by combination of bus and flight takes about 13.5 hours. Other options: do a combination of car, bus, and flight. The time zone difference when traveling from Coles Bay to Albany is minus 2 hours. In March, daytime highs in Albany are 74°F, while nighttime lows are 56°F. Finish your sightseeing early on the 10th (Sun) so you can drive to Margaret River. Eschew the tourist crowds and head to Meelup Beach and JahRoc Galleries. Escape the urban bustle at Jewel Cave and Surfers Point. The adventure continues: indulge in some culinary diversions at a local gastronomic tour, indulge your senses at some of the top wineries in the area, and explore the fascinating underground world of Lake Cave. For where to stay, maps, more things to do, and other tourist information, read Margaret River itinerary planning tool . You can drive from Albany to Margaret River in 4.5 hours. Other options are to take a bus; or do a combination of flight and bus. Finish your sightseeing early on the 13th (Wed) to allow enough time to travel back home.